CD-EXPRESS RECYCLING SYSTEMS GET YOU STARTED IN RECOVERING CONSTRUCTION & DEMOLITION DEBRIS. | Fuller, Ritchie, and Sturgess, INC. 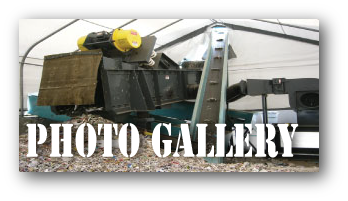 Designed for recyclers processing 150 yd/hr and less, GK’s portable CD-Express(TM) features Para-Mount II® 2-mass vibratory feeder for system loading and presentation to sorting system. 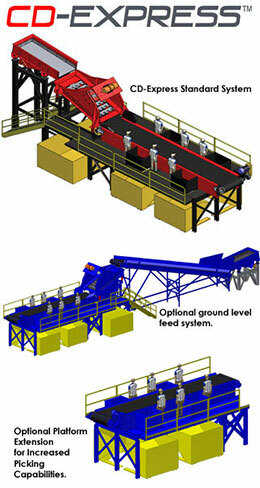 From loading, material is then processed over GK’s Finger-Screen to remove fines and under sized material for Alternate Daily Cover or other applications. Fines are then conveyed under a magnet or over a magnetic head pulley to remove any small metals. Oversized material is conveyed through a pick station and is sorted into roll-off containers or hoppers for contained material separation. The CD-EXPRESS recycling system can be set up quickly, and with addition of De-Stoner Air classifier at the end of the line to separate lights and heavies such as paper and rock, recyclers can divert up to 90% of recyclable material.